The ship is almost identical to NASA's Space Shuttle. unmanned space flight on November 15, 1988. The Russians watched the American space program and realized that they needed a space shuttle of their own. 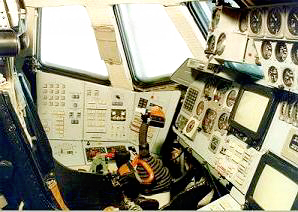 Unlike the American shuttle the Buran was only going to be used for missions which could not be done by other craft. The window is constructed of multi-layered tempered glass impregnated with a photo-reactive chemical layer which darkens in response to sunlight exposure. The outer frame is made from a titanium alloy. The entire window assembly weighs approx. 70 lbs. which is the world's most powerful rocket. It returned to a runway landing in Russia. It now sits, missing many pieces, deteriorating in Moscow. As you can see, the Buran looks very much like the American shuttle and the Russians admit borrowing the blueprints. But it is not an exact copy of NASA's Shuttle. The maiden flight was unmanned, controlled only by computers. With it's deteriorating economy, the Russians could not justify the expense of making the Buran shuttles operational, and the original and several uncompleted models today sit in storage. In August, 2003 we were fortunate enough to actually acquire an authentic Buran Space Shuttle Window.